“The unicorn lived in a lilac wood and she lived all alone.” I think about this opening line, sometimes; how simplistic, how straightforward. How sad. There is no “once upon a time,” but you feel it there all the same. It’s the kind of opening line you dream about coming up with as a writer – but that might be because what follows it is so artfully crafted that the weight of the whole story rests, in turn, on that very first sentence. 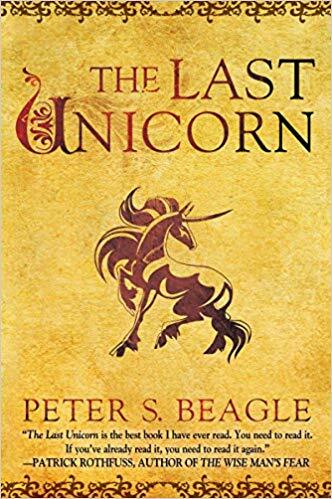 Peter S. Beagle’s most well-known work is also one of his earliest, and it has more than stood the test of time. A self-aware fairytale, “The Last Unicorn” follows the titular unicorn on her hero’s quest to find and free the rest of her species from imprisonment by the lonely King Haggard, who has captured all the other unicorns because they are the only things that make him happy. The unicorn is joined on her journey by Schmendrick the magician, a young man cursed with immortality until he can unlock his potential for true magic but can only perform bad card tricks in the meantime, and Molly Grue, a woman with a sharp tongue and a soft smile whose resilience and love break my heart in all the best ways. Not only is Beagle’s language beautiful and evocative but his commentary on standard character archetypes is clever, thought-provoking and thoughtful at the same time. One example of this metafictional commentary occurs during the unicorn’s final confrontation with the creature that guards the captive unicorns. Haggard’s son, Prince Lir, demands that Schmendrick do something to save her, asking what good magic is if it cannot even save a unicorn. “That is what heroes are for,” Schmendrick tells him – and it’s true, wizards in fairytales don’t charge in to save anyone, heroes do. There are very few stories that manage to function both on a narrative level and a metafictional level, but those that do are breathtakingly beautiful in their craftsmanship. “The Last Unicorn” is one such story. Beagle’s characters question the roles they seem to have been given, question the line between fiction and reality and even tease the idea of what would happen if they terminated the narrative early and left the quest unfinished. It’s impossible to read this book and not be left thinking: about the characters, about lines like this, about the nature of stories in general. Needless to say, if you’re looking for a casual read, this isn’t what you’ll want – but if you’re in the mood for a book that will ask you to reevaluate what you know about fairytales, reality and narrative – all while tugging at your heartstrings – pick up “The Last Unicorn.” You won’t regret it.